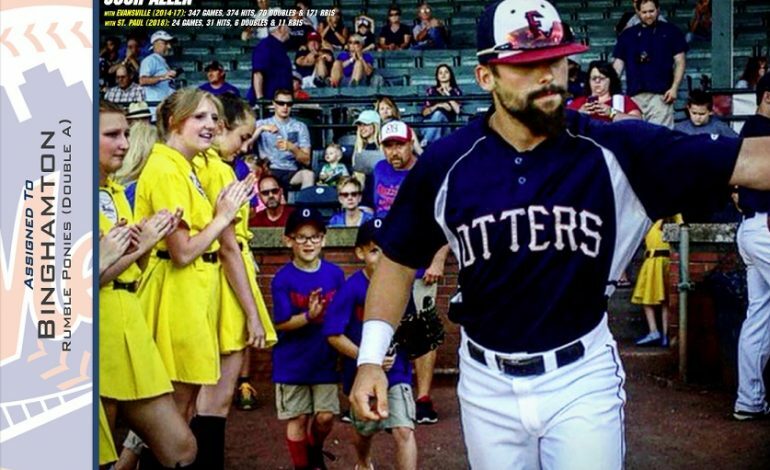 A former Evansville Otters baseball player has a new home in the New York Mets organization. Former Otters second baseman Josh Allen was a member of the St. Paul Saints in the American Association before the Mets purchased his contract and assigned Allen to Double-A Binghamton, according to a press release from the Otters. He will soon join the Rumble Ponies roster and play alongside former Denver Broncos quarterback Tim Tebow. In January, the Otters traded Allen to St. Paul for catcher Mike Rizzitello and a player to be named later from the Saints. Evansville manager Andy McCauley expressed his support for Allen and the next step of his career in the release. So far with the Saints in 2018, Allen played in 24 games and recorded a .344 batting average with 17 runs, 31 hits and six doubles. He also posted two triples and four home runs. Allen finished his Otters career as the all-time franchise leader in triples (19), stolen bases (76) and hit by pitches (51). In 2016, Allen was an all-star and set a single-season franchise record by recording a .354 batting average. Allen earned the Frontier League Most Valuable Player award that year and was also an all-star in 2014 and 2017.